Give the gift of dinner, dancing and live music! This rockin’ dinner club features an eclectic menu and live music nightly. The live music changes nightly and the genres span from classic rock to sultry vocals and crooners, to top 40 hits. Your gift will be the perfect night out! 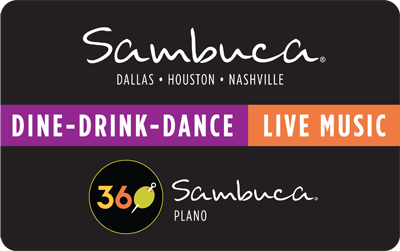 Sambuca gift cards are honored at any of our restaurants. In order to purchase a gift card on this site, you must select Federal Express overnight shipping for orders placed before 4:00 PM Central Standard Time Thursday, December 21 for delivery before Christmas. We cannot guarantee delivery for Christmas for any orders placed after 4:00 PM Central Standard Time Thursday, December 21.